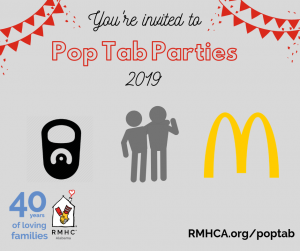 One of the many programs we offer at the Ronald McDonald House in Birmingham is field trips — these include everything from trips to the McWane Science Center, Barons Baseball Games, sometimes special events that happen to be in town and even monthly trips to The Red Barn in Leeds. These trips are important for families staying with us to experience different things and have a break from their day-to-day routine at the hospital. During trips to The Red Barn, families staying with us are able to escape for the day and enjoy the wide open spaces, beautiful scenery and, of course, the horses. The Red Barn serves over 100 individuals a week coming from all different walks of lives and partnerships — everything from the Girl Scouts to kids in foster care. We are so thankful for each trip we take. Each time seems better than the last and we know this is a partnership that is going to help so many families we serve. Guests can use this time to get away from the hospital and the city scene while forgetting about their troubles for a couple of hours. 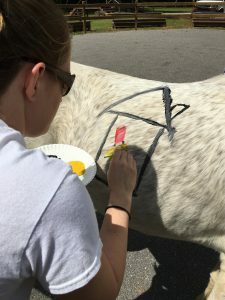 Red Barn has several types of programs that include everything from petting and brushing the horses to painting on them. Individuals are also able to take nature walks, lay in hammocks, swing, and so much more. With creeks, rivers, a cat and even a dog, there is truly something for everyone. Each horse at The Red Barn has a unique story, just like each one of the families staying at the House. 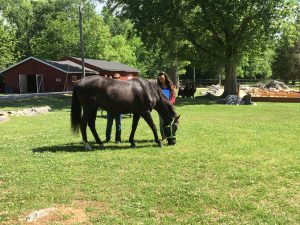 The staff at Red Barn does an amazing job making each guest feel like they are at home and connecting them with the program and the horse that can make their experience the best possible. They know some horses are better for certain programs, but also know the importance of connecting with something bigger than yourself. Kids can see that Ziggy’s scars make him look different, but they can also see he is still beautiful. Families can connect with Derrill who is friendly to every human he meets and even take selfies with Little Boy Blue if they want! One guest told us how much it meant to him to be there for the day — the taste of fresh air and the scenery was just like home for him. 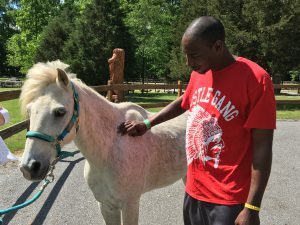 His family has been at Ronald McDonald House Charities of Alabama for over 8 months and an escape that reminded him of the place he misses is something that cannot be replaced. To learn more about other family programs we offer, or to get involved yourself, please explore our website.